When people think of snowy climates they likely think of any other state besides Texas! While Texas may barely receive enough snow to merit a snowfall total by the National Weather Service, we did see snow in mid-January! The Snow flurries may be mostly gone, but with the fluctuating weather we’re seeing high winds paired with cold temperatures that are causing freezing. Freezing rain may also become a factor and with everything freezing, you’ll likely experience slick streets and walkways. What doesn’t cross people’s minds, especially if you’re not accustomed to what icy conditions bring, is de-icing your roof. If you recently had roof restoration work or roof maintenance performed, protect your investment and read more about de-icing your home’s roof. Roof’s are meant to protect a home from the outer elements, right? So why do you need to de-ice a roof? And in the same vein, shouldn’t it take care of ice naturally itself? These are all really great questions. Roofs are designed to securely keep weather out and to protect you from all the elements from the scorching sun to the frosty snow. Most roofs are at a pitch between 4/12 and 9/12 and are equipped with a pitch that allows melting snow and water to run off. Roofs run into trouble when melting snow or water freezes and it has no reprieve from freezing temperatures. When snow and ice are left on your roof and gutters for too long, they can get bogged down and result in roof damage such as cracks and leaks. These issues can cause internal water damage and seep into wood, plaster, and drywall. This can cause rotting, mold, and structural damage. 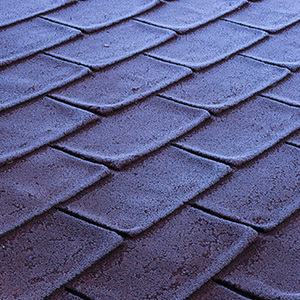 Another issue that happens is when an ice shelf or sheet melts and falls from your roof, only to take shingles with it. Missing shingles can leave your roof vulnerable to the elements and invite local critters in. If a winter storm caught you by surprise and left you in shock with thick, hanging icicles and frozen downspouts, there are things you can do to prevent damage. Before you tackle the job yourself, you always have a trusted roof expert such as Texas Star Roofing to help you make the right call. We’re happy to talk with you over or come out for a consultation. After all, winter weather in the Dallas-Fort Worth area can be shocking! If you’re ready to take a look at your roof for de-icing, always locate first where the water is coming from. You may already be subject to a leak in your roof, poor insulation, improper ventilation, or unsealed edges on windows. Once you know there is no damage, you can move to de-icing it. Ice dams – The thick layer of ice within your gutters that freezes and runs over the edge, causing icicles. Ice dams can also back up onto your shingles and seep underneath them, causing water damage. Icicles – Icicles resulting from ice dams. Frozen downspouts – These occur when the gutters are overwhelmed with an abundance of melting snow and the downspouts freeze while trying evacuate the water. Consider knocking off large, precarious icicles, but try and avoid chipping the entire ice shelf off. Ice can be dangerous, especially if you knock it loose and are in its path — you could seriously injure yourself. Removing an ice shelf yourself could also make your shingles’ warranty null and void. 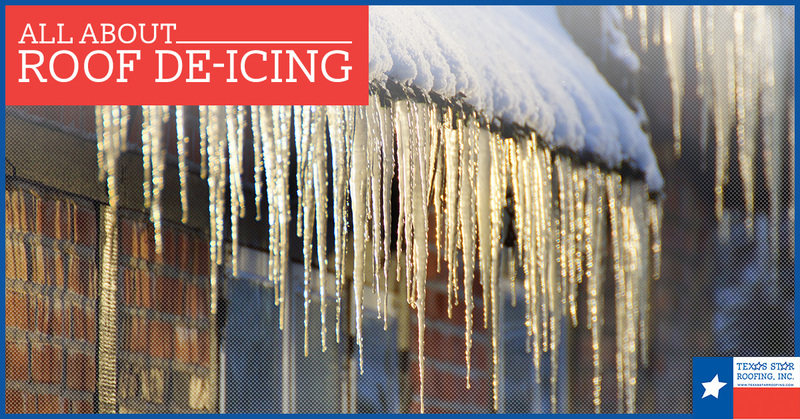 Save yourself money and your roof damage, and only focus on removing icicles. Keep in mind, while icicles are beautiful and hard to come by in Texas, it probably means you have an ice dam. Why are ice dams concerning? In addition to an ice shelf that is on your roof, an ice dam forms a thick, solid ridge of ice that runs and retreats in your gutters after a storm — the meltwater has to have a place to go. Ice dams can be an issue when the warmth from your home’s hot air begins to melt the snow off of the roof. The snow melt flows downslope and stays in the gutter where the temperature is no longer warm and the water freezes. When water freezes, it expands and becomes heavy, weighing on the gutter system. As more snow melts, it has nowhere to go, so it begins to flow over and form icicles. With the increased influx of snowmelt, the meltwater can creep up under your shingles and straight into your home. So, ice dams can cause damage by ripping the gutter away from your home as a result of increased meltwater, and they can also build up beneath your shingles, causing water damage in your home. You can help prevent ice dams with proper insulation since they start to form from hot air from your home. If it’s too late for insulation prevention, you can rake snow off of your roof to prevent snow buildup. Similar to preventing ice dams, you can rake your roof to remove the snow manually. This needs to be performed right after a storm to prevent the snow from melting and creating an ice sheet. There are de-icing chemicals on the market that allow for the snow to melt, but again, if it’s cold enough to freeze the snow as it melts, you run into the same issues. It may be wisest to use it on the ice shelf when temperature are warmer. Common roof de-icing chemicals include calcium chloride, calcium magnesium acetate, magnesium chloride, and potassium chloride. These de-icers are relatively inexpensive and work well. The best practice with de-icers is to apply them before the snowstorm so the snow doesn’t even have a change to stick. If you’re not entirely comfortable removing ice dams or ice shelves, please contact a professional. It isn’t always safe or in good practice to do it yourself. Here at Texas Star Roofing we have the experience and skills to assist or consult about your roof, and make roof repairs if needed. If the snow this winter has left you puzzled and scrambling for roof solutions, contact us today at Texas Star Roofing. We serve the Dallas-Fort Worth area which includes Plano, Allen, and Frisco. Let us know how we can help with a new roof or roof maintenance!